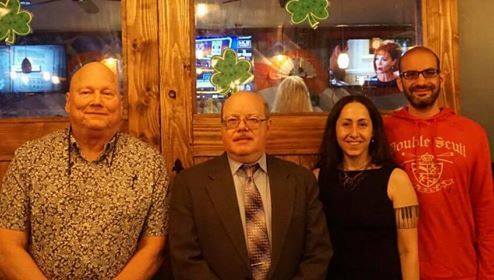 The Libertarian Party of Staten Island held their annual convention Sunday, February 24. The convention had 40 guests in attendance. The 2018 Libertarian gubernatorial candidate, Larry Sharpe spoke, as well as NYC public advocate candidate Daniel Christman and congressional candidate Charles Hargrove. At the convention, Staten Island LP members elected new their new officers. Rocco Fama was elected Chair, Debra Altman as Vice Chair, Richard Bell as Treasurer and Charles Hargrove as Secretary. The Staten Island Chapter also decided on their meeting schedule for this year. Meetings will be held the last Sunday of every month starting at 5pm and are tentatively to be held at Liberty Tavern. 2019 goals for the chapter include growing local Libertarian party membership, organizing community events to help the homeless and to clean up neighborhoods, and attempting to secure liberty-minded referendums tackling things such as red light and speed cameras. Those attendees interested in learning more about Liberty and Libertarian ideals left with two books courtesy of Staten Island LP; a copy of “I Pencil,” a favorite of Milton Friedman’s and “Are We Good Enough For Liberty?” by Lawrence Reed. If you are interested in getting involved with the Staten Island Libertarian Party, visit their Facebook page or visit lpny.org for info on your local affiliate and how to get involved.